There are two ways of approaching the analysis of the markets. The first is to use subjective techniques like Trend Lines and Gann Fans. There is nothing wrong with that at all. If you only work with a small number of securities, then this is a great way to work. It does take discipline to follow your rules, but it is an approach that has lasted for decades and has produced many masters of analysis. The second way is to use objective rules to let the computer find the candidates that you should be trading. A lot of work goes into setting up the rules and testing them to ensure that they truly do add value, but once it is done, you have a statistical model that clearly defines the expectations. Both ways of approaching the market are valid, which one you choose depends on the type of person you are and the number of securities that you need to trade. 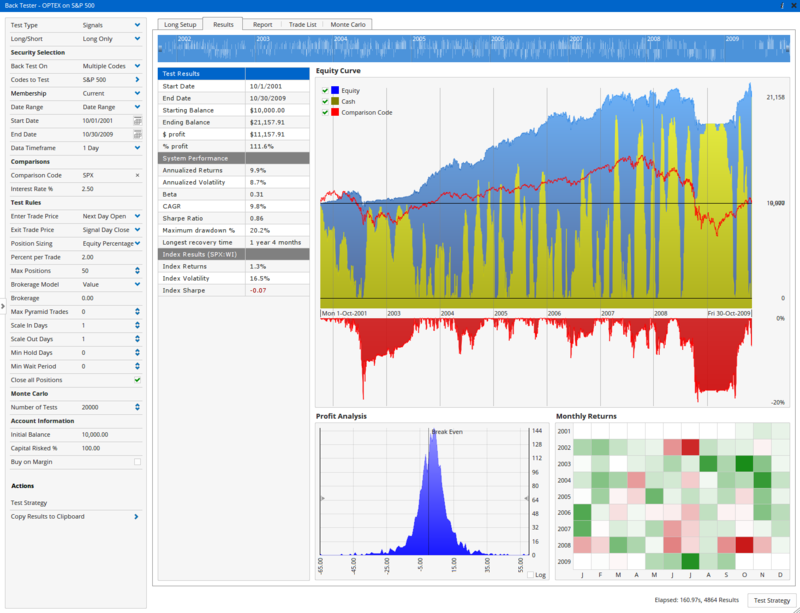 The rest of this page is dedicated to highlighting the Quantitative tools and process that is available in Optuma. Note: Not all editions have all quantitative modules, but it is available as an optional add-on. When you come up with an idea for a Signal (a trade entry or exit), you need to be able to test that idea to see if adds value. Traditionally people would use a Back Test (sometimes called a System Test), but the problem with that is that we have a veritable witch’s cauldron of variables being tested at once (entry, exit, starting capital, position size, max number of positions, stops, targets etc). Adjusting any one of those will have an affect on your results. The worst part is that you may be missing some of the best (or worst) signals, due to insufficient capital, and you would not have known. The Optuma Signal Tester has been designed to overcome all of that. It simply allows us to specify a signal using the easy Optuma Scripting Language. Then the signal tester finds every single instance of that signal and measures the returns over the following days. All those results are then averaged to give you your results. 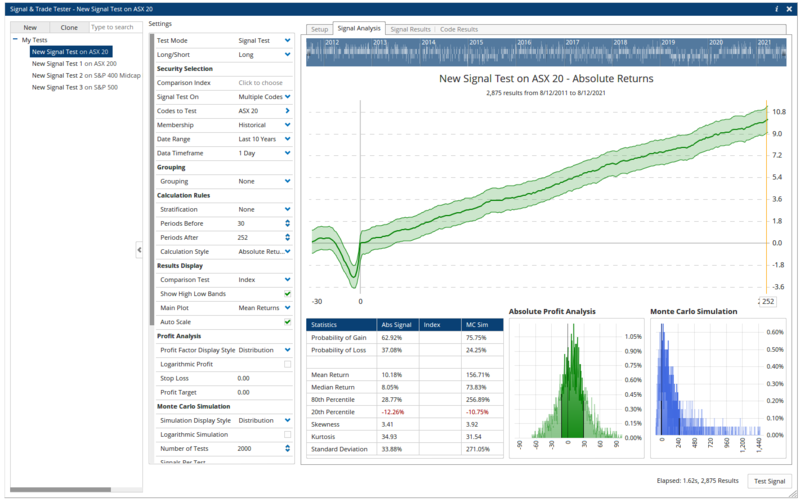 The Signal Tester will allow you to see how often that signal leads to profit (Probability of Gain) and the Mean or Median returns. If you have a data source that supports it, you can even group equities by Sector and Size and see how the Signal works on different groups. 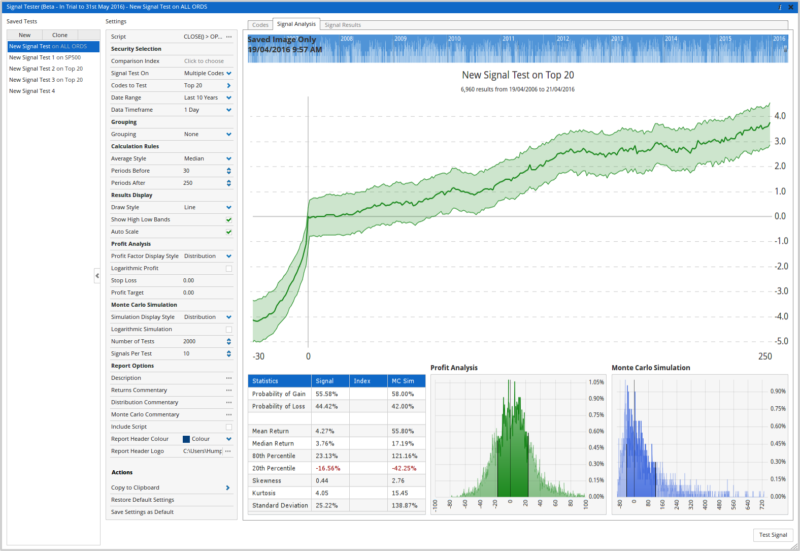 Signal Testing is a powerful tool that can take a bit of time to get used to, but it helps to answer the question whether your signals are really adding value. Every time a signal is being measured, a measurement is also being taken in the benchmark index. This way you can clearly see on the results how much value you are actually adding over the benchmark. The next step is to test the combination of entry and exit signals together. This is exactly like the Signal Tester but introduces the exit rules. 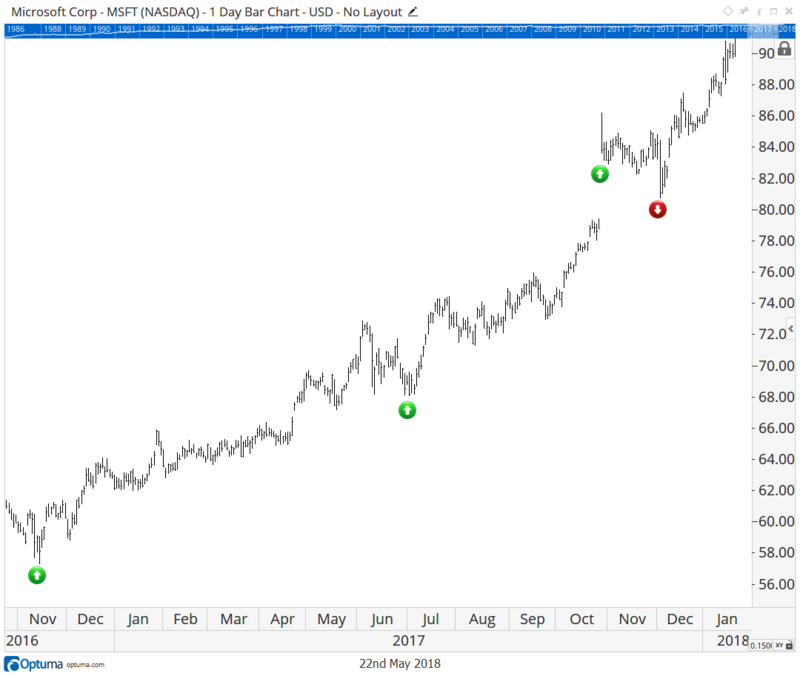 By using the Trader Tester, you can find every single trade opportunity, even if there were 3 buy signals followed by a single sell signal (as pictured). Every combination of Buy and Sell is a valid trade that “could” have happened. Our philosophy is that we would be making a big mistake if we did not test all three. When you test with the Optuma Trade Tester, you are testing all the possible trade combinations. Again, like in the Signal Tester, totally ignoring all the constraints and biases that a Back Test can introduce. Once you know the effectiveness of your signals and the best combination for trade setups, then we can move to Back Testing. The final step is the Optuma Back Tester. You can create tests to test based on entry and exit signals or rebalance a portfolio on a monthly basis based on your own ranking rules. Once the processing is done, you’ll easily be able to see how your strategy went (blue shaded plot) compared to the benchmark index (red line). You’ll even be able to see your drawdowns (red shaded plot) and how often your strategy went back to cash (yellow plot). All the standard risk and reward measures are included as part of the report and you can export all the trades so that you can do further analysis in Excel. 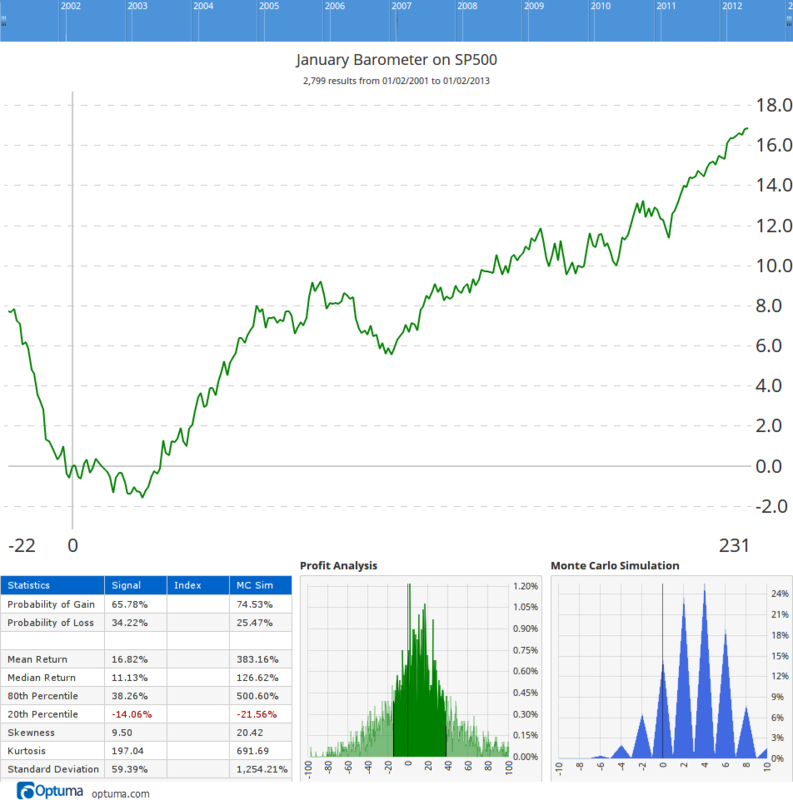 The best part is that you can use the Blue history slider at the top of the screen to see how your strategy performed at different phases in the market. Any good scientific process needs to have a representative sample that you can compare your results against. It’s all part of helping you answer the question whether your selections process (your signal) is any better than random or not. But how can you generate a representative sample? You can’t just select random trades, as they will not match the profile of the idea being tested. The key point is that we make returns by being exposed to the market (having a trade). So if we want to compare apples with apples, we need to make sure that our sample distribution has the same exposure to the market. 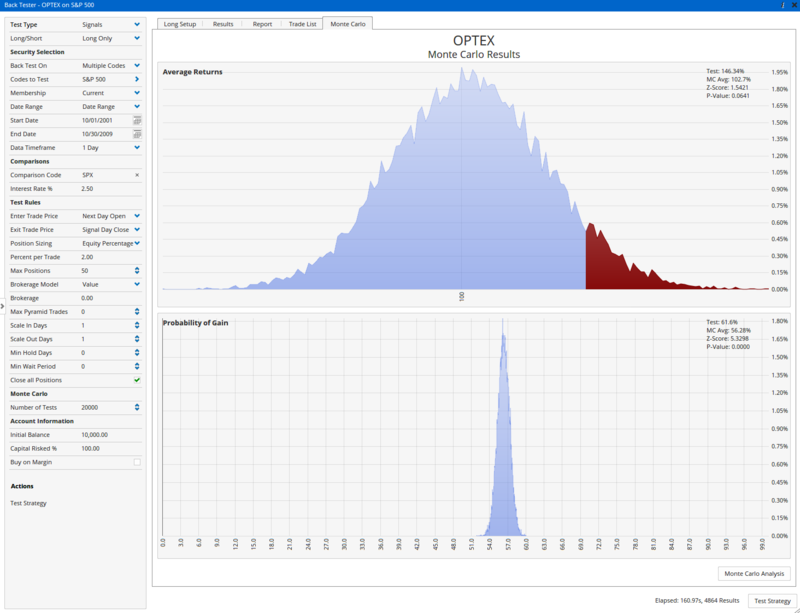 The Optuma Back Tester has introduced a ground breaking method of using a Monte Carlo process to build a representative sample distribution. The software takes every trade in your system test results, randomizes the start date, randomizes the security that the trade was executed on, but keeps the hold time the same. The results are compounded and you have one result. The software then repeats that thousands of times to produce a random sample distribution that has the same exposure to the market. The point at which the colour changes from Blue to Maroon, is where your test lands on the sample. Your goal is to have a strategy that has as little maroon as possible in the plots. In statistics we call the maroon area the p-value and the smaller it is, the less likely that your results are due to chance. That means that you have more confidence that you really did add value and you can have a lot of confidence in your strategy. 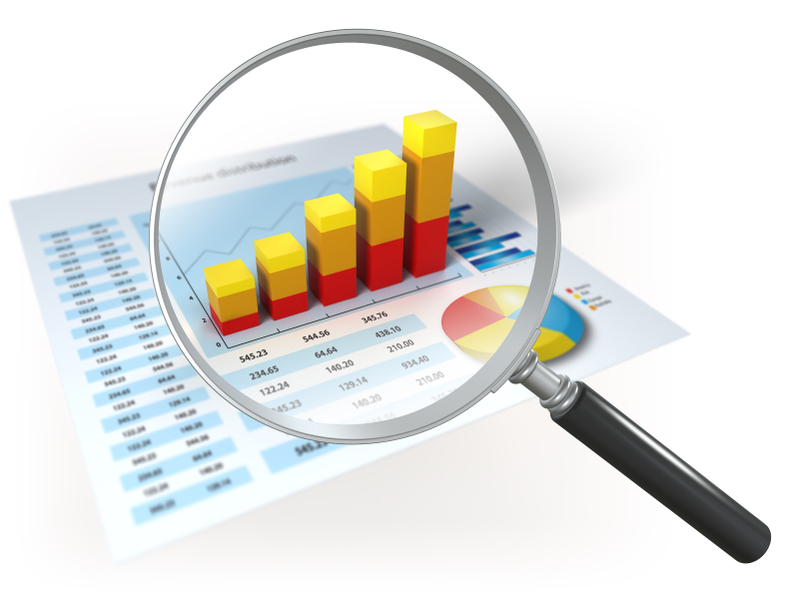 We have many webinars and articles available that talk about the Quantitative Tools in Optuma. A great place to start is the video introduction for a course that we are building for our clients. 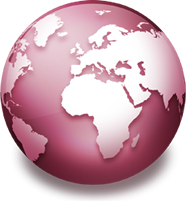 You’ll find a lot more information in our Knowledge Base, including webinars and articles. At Optuma we are proud of our initiatives that are making Quantitative methods available to a new generation of financial analysts. We know that Optuma can make a huge difference to your analysis and work-flow, but remember that it does take time to get used to a new way or working. There is an investment that you must commit to before wasting your own time with a trial. You need to spend at least an hour a day using Optuma. That way you will know by the end of the trial if Optuma adds value to you or not. If you are ready to give it a go, you can click on the “Request Trial” button. If you would like to hear from us when we publish posts on our work, make sure you sign up to our free blog. We don’t post often, but we make sure that what we post is beneficial to our clients and casual readers alike.